While some may hear "tattoo" and think of anchors and hearts bearing the legend "mom," there are other softer, more feminine designs. 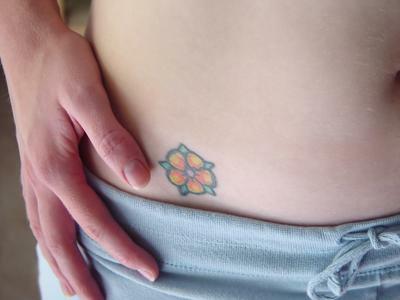 For many individuals, flower tattoos are the perfect expression of body art. They're elegant and expressive without being predictable, and the wide variety of available designs ensures a perfect choice is available for everyone. A wide range of flower tattoo styles is available, all with their own symbolism to consider before you get inked. There are many different types and styles of flower tattoos. These include realistic blooms, stylized representations and multi-flower designs. The ingenuity and uniqueness of the tat is only limited by the artist's imagination, giving flowers an immense range of applicability to different individual's inking preferences. Certain flowers, such as roses and lilies, are seen more than others, but literally any flower can be turned into a tat as long as there is a skilled tattoo artist on the job. Roses are indisputably the most popular floral tattoos. A single, vibrant rose can express love, romance, caring and beauty. At the same time, the flower's thorns may represent hardship, fierceness or danger. Just as with the variations of the flowers themselves, the most popular color is red, while yellow, white, purple and black are also frequently used for different designs and to convey different intentions. Couple a rose with a ribbon or banner bearing the name of a loved one or with religious imagery, as the rose can represent Jesus Christ, and the Rose Cross is a symbol of some occult groups. Flowering vines are popular tattoo motifs, often used to encircle an arm, ankle or navel, or as a frame to another tattoo design. Depending on the size of the vine, it may have only a few blooms or clusters of colorful flowers sprinkled along its length. The flowers may be small or large depending on the design, and the types of flowers often vary (though one vine looks best using a consistent type of bloom to create continuity). Choose single blooms other than roses as expressive flower tattoos. Most months (and therefore birthdays) are associated with a particular type of flower, which may be translated into a tattoo design for an individual expression. Hyacinths, gladiolas, daisies, lilies and orchids are popular blooms used as tattoos that are less predictable than roses, though a skilled artist will be able to recreate any desired flower from a photo, sketch, or even the actual plant. Flowers are often found as accompaniments to different tattoos, including hearts, fairies, women and names. Wind the bloom's stem around a part of the other design, or make it stemless and used as an accent or focal point. Depending on the intricacy of the design, the flower's leaves and petals may also be carefully placed as accents to further integrate the two symbols. Where a tattoo is placed is an individual consideration based on the type of design, its shape, size, public acceptability and personal preference. Place elongated designs or vines around ankles or arms, and single blooms on shoulders or hips. Bouquets can be designed to fit proportionally along the lower back, while a single, vibrant bloom may be centered around the navel. Choose a flower tattoo by finding the design that uniquely expresses your individuality and personality. While many people may assume that women naturally choose more floral tattoos, in fact many women don't find the designs appealing if they don't typically enjoy flowers. A man may use a flower to accent the name of his significant other or as a tribute to a special woman in his life, while less traditional flowers (black roses, for example) can exemplify a darker design for anyone. Flower tattoos are some of the most popular designs today. With their wide applicability to different individuals' preferences and their adaptability to be used with different designs, there is a floral tattoo available for nearly every situation. Consider one for your next tat.